Think Glam Rock and you will immediately think of the 70s. Tight lycra jumpsuits, studs and platforms. Glam Rock first started about 1973 and had reached its peak by 1975. 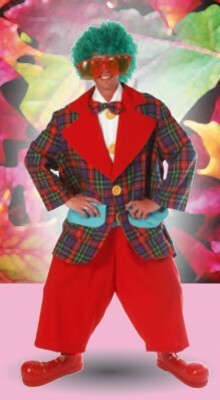 This fabulous Glam Rock suit in its outlandish colours, is perfect for a David Bowie style costume, or Ziggy Star Dust outfit, all it needs is the wig and make up. This is the best Glam Rock fancy dress we have seen anywhere! 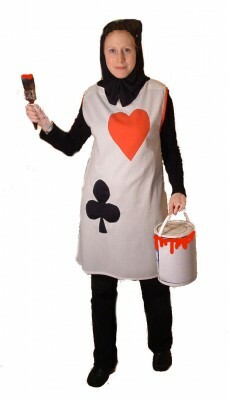 Another idea is to combine it with our Kiss costumes for the best set of Glam Rock costume around. 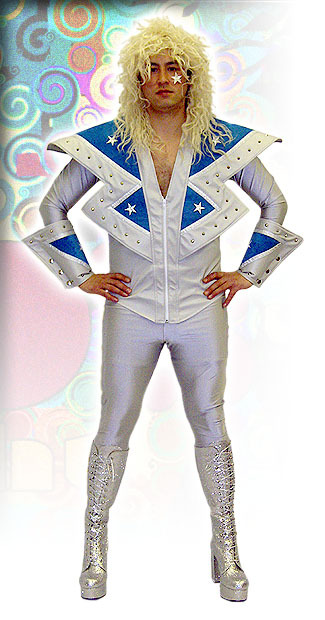 This Glam Rock Bowie fancy dress costume consists of lycra jumpsuit, white studded over waist coat with blue relief, and matching cuffs. Rocker wigs can be hired or bought when placing order, platform boots available to hire in various sizes and colours.